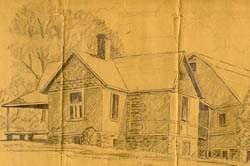 The Karl Von Ruck House, home of an internationally known pioneer in pulmonary medicine, is associated with perhaps the greatest era in Asheville medicine. Dr. Von Ruck was a dedicated scientist, medical researcher and a believer in the "climate theory" of tuberculosis treatment. During the 19th century, tuberculosis was the most dreaded disease in the world and the leading cause of death in the United States. It flourished in the rapidly growing cities of the world but was relatively uncommon in the mountainous areas of the United States and Europe. When resting in the cool mountain air, patients began to gain strength and their lesions showed evidence of healing. Asheville offered the best combination of altitude, atmosphere and climate considered essential in the treatment of lung disease. Von Ruck, who moved to Asheville in 1886, become one of the city's most remarkable physicians. In 1888, he opened the Winyah Sanitarium where he could treat patients and conduct research on lung disease. Fourteen years later, Von Ruck was joined by his only son, Silvio, who had also become a pulmonary disease specialist. In 1904, Von Ruck purchased 20 acres of land, including two sizeable frame houses. The larger of the two became the family home and was eventually connected to the smaller house by a two-story music room designed by Smith & Carrier, complete with 4,800 handmade organ pipes. This created a massive and elaborate residence of weatherboard, shingle and pebbledash, projecting bays, porte cochere and conical roofs. The interior of the Von Ruck house retains most of its original oak and mahogany detailing. The second floor retains Dr. Von Ruck's pharmaceutical glass-front cabinets lining the walls. Von Ruck occupied the house until his death in 1922. Many notable physicians who studied under Dr. Karl Von Ruck became the famous "TB" specialists of Asheville, including Dr. Chase P. Ambler, Dr. William Leroy Dunn, Dr. Charles Launcelot Minor, and Dr. Martin Luther Stevens. These great physicians established Asheville as the outstanding tuberculosis treatment center in America. 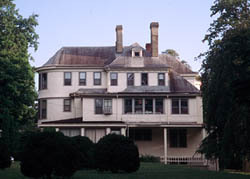 The Karl Von Ruck House is located at 52 Albemarle Pl., off of Charlotte St., within the Chestnut Hill Historic District. The House is now apartments and not open to the public.